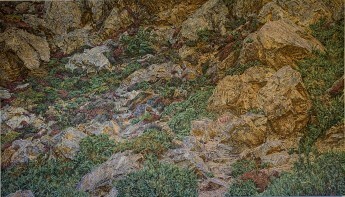 Pastel on paper on board, 48" x 84¼" (1,22m x 2,14m). Joanna Kirk studied at Goldsmiths College, London and has exhibited widely. Her work is found in various private and public collections including the Murderme Collection, Saatchi Collection, Arts Council of Great Britain, Scottish Equitable, Contemporary Art Society, and Nordstern Insurance Company. She is one of the very few contemporary artists who works in pastel. She draws with the pastels directly on to the paper, but the effect is painterly. Her work is often on a very large scale - over two metres wide - and her subject is the landscape. But it is not simply a depiction of the natural world. These layers and layers of detail reveal on closer viewing, a small human presence - always one or both of her own children, partially concealed. This adds a very different perspective to the work and one which is crucial to her and to a better interpretation of her work.